There’s been no shortage of news stories on veritably preventable accidents which lead to life-altering, debilitating head injuries. No age group is safe, and the use of reliable head safety gear is of utmost significance for children and adults alike, with an emphasis, of course, to those affected by certain seizure-inducing medical conditions, namely epilepsy, as well as individuals with special needs. Opti-Cool Headgear is a US-based company founded by two parents who poured their time and resources into creating head gear that would “protect, provide comfort, and fit” their son – and every other child and adult in need of lightweight, versatile and secure helmets for their everyday needs. The company’s flagship product, the Opti-cool Helmet, is both a preventative and recovery injury aid, whose unique features have quickly rendered it the go-to choice for customers across the United States looking for medical helmets providing an excellent level of protection, as well as an unsurpassable level of comfortable wear. The first helmets ever molded out of durable and utterly hygienic Grade A EVA foam, all Opti-Cool Headgear models boast a ventilated core, as well as a soft, hook-and-loop Velcro strap with a removable chin guard, for optimal fit and lasting comfort. Thanks to the company’s patented headgear designs and technology, all Opti-Cool Headgear can be customized with the addition of multiple cold packs, which are medically recommended for alleviating migraines, and expediting head injury recovery. 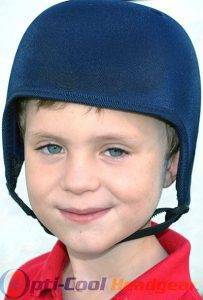 The Opti-cool Helmets have many uses and applications for preventative care for various types of special needs. Just to name a few are Epilepsy, Autism, Balance Disorders, bleeding disorders, motor developmental delays, elderly patients and head injury recovery. Come see the latest designs and have the comfort of owning an Opti-cool helmet today.